Santa's reindeer have infinite life expectancy. Santa's reindeer (R.t. saintnicolas magicalus) look very similar to common reindeer or caribou, but have many characteristics that distinguish them from the seven other common subspecies. In Europe, caribou are called reindeer, but in Alaska and Canada only the semi-domesticated form is called reindeer. All caribou and reindeer throughout the world are considered to be the same species, and, including Santa's reindeer (R.t. saintnicolas magicalus), there are 8 subspecies: barrenground (Rangifer tarandus granti), Svalbard (R.t platyrhynchus), European (R.t. tarandus), Finnish forest reindeer (R.t. fennicus), Greenland (R.t. groenlandicus), woodland (R.t. caribou) and Peary (R.t. pearyi). Alaska has mostly the barren-ground subspecies and one small herd of woodland caribou. Canada has three subspecies, the Peary, woodland and barren-ground. In most subspecies of reindeer/caribou, the largest bulls shed their antlers in late October, small bulls and non-pregnant cows shed theirs in April, and pregnant females usually retain their antlers until calves are born in late May. It is not known when or if Santa's reindeer shed their antlers. We do know, from a few furtive sightings, that their antlers appear extremely velvety and robust in late December. Santa's reindeer also possess the unique and remarkable ability to fly. A strenuous conditioning program developed by Mr. and Mrs. Claus enables them to travel great distances in a short time period, provided they receive frequent carrot snacks. For more information, including a copy of the Alaska's Wild Wonders kids magazine issue on Antlered Ungulates (and a page on caribou), visit the More Resources tab above. To see all the information in this profile on one page, click on the printer-friendly link above. Little is known about reproduction but it does appear that the life expectancy of Santa's reindeer is infinite. No deaths or fatalities have been reported, and none are expected in the foreseeable future, though stories are told of numerous "close calls" due to slippery rooftops and heavy jet traffic around major airports. Like other subspecies of caribou, Santa's reindeer eat the leaves of willows, sedges, flowering tundra plants, and mushrooms during the summer. They switch to lichens (reindeer moss), dried sedges (grass-like plants), and small shrubs (like blueberry) in September. An interesting question is how such foraging behavior is possible at the North Pole, an icy region in which plant life can't be said to prosper. But then again, Santa's house is not an ordinary place. The diet of Santa's reindeer during the month of December consists almost entirely of carrot snacks. This enables them to fly long distances, during short periods of time, in unfavorable visibility conditions. Researchers differ over whether the annual night flight of R.t. saintnicolas magicalus may technically be considered a migration. Santa's reindeer are reported to live at the North Pole, where they are cared for by Mr. Claus, Mrs. Claus, and a handful of specially trained elves. It must be very pleasant for Santa's reindeer in that land of ice, for throughout the short Arctic summer and long winter, Santa's reindeer rarely stray from their snowy home. One night of the year, however, observant children may detect traces of these elusive creatures anywhere human beings are known to dwell, from the busiest cities to the deepest jungles. The geographic range of R.t. saintnicolas magicalus may thus be considered larger than the range of any other member of the genus Rangifer. 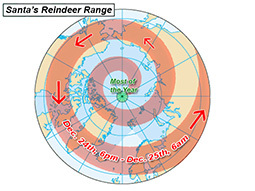 The movement of Santa's reindeer on Christmas eve is well documented. But what about their caribou cousins? These two animated maps show the movements of caribou herds over the course of a year. The map labeled North American herds shows four Alaska herds and eight Canadian herds. The map labeled Alaska Caribou herds shows the four northernmost herds (Teshekpuk, Western Arctic, Central Arctic and Porcupine) of the 31 caribou total herds in Alaska. The Porcupine herd ranges into western Canada. Note that the caribou bunch up or aggregate in June on the calving grounds. Caribou herds are counted shortly after these aggregations begin to occur, typically in early July. Data were collected from about 1990–2006. This project was done by CARMA — CircumArctic Rangifer Monitoring and Assessment Network. The Network is an international group of scientists, managers and community people who have a common interest in caribou. 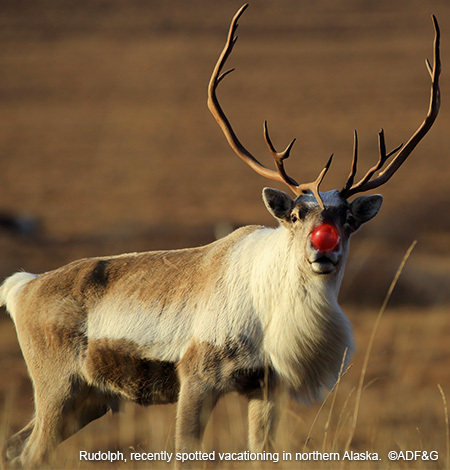 Though there are very few Santa's reindeer, they are not listed as threatened or endangered. This is due to their unusual life expectancy, which is infinite. Adult bulls average 350–400 pounds (159–182 kg); Mature females average 175–225 pounds (80–120 kg). Santa's reindeer are found exclusively at the North Pole, with one yearly exception.